A positive correlation is a relationship between two variables where if one variable increases, the other one also increases. A positive correlation also exists in one decreases and the other also decreases. The more time you spend running on a treadmill, the more calories you will burn. Taller people have larger shoe sizes and shorter people have smaller shoe sizes. The longer your hair grows, the more shampoo you will need. The less time I spend marketing my business, the fewer new customers I will have. The more hours you spend in direct sunlight, the more severe your sunburn. The more money she saves, the more financially secure she feels. As the temperature goes up, ice cream sales also go up. When an employee works more hours his paycheck increases proportionately. The more gasoline you put in your car, the farther it can go. The longer someone invests, the more compound interest he will earn. The longer amount of time you spend in the bath, the more wrinkly your skin becomes. As it snows more, the sales for deicers go up. As you drink more coffee, the number of hours you stay awake increases. As a child grows, so does his clothing size. As her salary increased, so did her spending. The more it rains, the more sales for umbrellas go up. Taller people tend to weigh more and shorter people tend to weigh less. As a person's level of happiness decreases, so does his level of helpfulness. People who suffer from depression have higher rates of suicide than those who do not. As more people go to the movies, the amount of money spent on tickets increases. When workers get a raise, morale improves. As tread on your car's tires decreases, traction with the road decreases. As the level of water lowers in a fish tank, the volume of the habitat for the fish decreases. 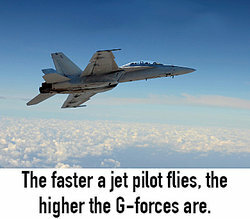 The faster a jet pilot flies, the higher the G-forces are. The more you exercise your muscles, the stronger they get. When employees make a high salary, efficiency increases. As the wattage of light bulbs increases, the light output increases. As the number of trees cut down increases, the probability of erosion increases. In archaeology, a more stable landform means more site visibility. As the temperature decreases, the speed at which molecules move decreases. As the speed of a wind turbine increases, the amount of electricity that is generated increases. As the amount of moisture increases in an environment, the growth of mold spores increases. As algae increased in the lake a certain species of algae eating fish increased. As the percentage of salt in salty water increases, buoyancy increases. As you eat more antioxidants, your immune system improves. High school students who had high grades also had high scores on the SATs. As attendance at school drops, so does achievement. When enrollment at college decreases, the number of teachers decreases. As a student's study time increases, so does his test average. The more years of education you complete, the higher your earning potential will be. College students with higher SAT scores also have higher grades in college. By reviewing different examples of positive correlations you can see that correlations can be used in many aspects of every day life and science. "Positive Correlation Examples." YourDictionary, n.d. Web. 23 April 2019. <https://examples.yourdictionary.com/positive-correlation-examples.html>.